In our lives, we constantly talk about practicing to attain perfection. How much one practices and how much one will gain depends on the mindset during the practice. Sometimes, more effort does not mean better results or less effort, lesser results. To understand how or why one should reconsider the way their practice is being done, I have decided to post the following text. 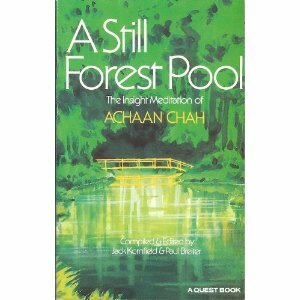 This text is an excerpt from the compilation of a Thai Meditation Teacher, Achaan Chah‘s teachings in a book entitled ” A Still Forest Pool – The Insight Meditation of Achaan Chah “. As you practice, various images and visions may arise. You see an attractice form, hear a sound that stirs you- such an image must be observed too. This kind of vipassana image can have more energy than one that may arise from simple concentration. Whatever arises, just watch. Someone recently asked me, “As we meditate and various thing arise in my mind, should we investigate them or just note them coming and going?” If you see someone passing by whom you do not know, you may wonder, “Who is that? Where is he going? What is he up to?” But if you know the person, it is enough just to notice him pass by. Desire in practice can be a friend or a foe. At first, it spurs us to come and practice; we want to change things, to understand, to end suffering. But to be always desiring something that has not yet arisen, to want things to be other than they are, just causes more suffering. Someone asked, “Should we just eat when hungry, sleep when tired, as the Zen masters suggest, or should we experiment by going against the grain at times? And if so, how much?” Of course, one should experiment, but no one else can say how much. All of this is to be known within oneself. At first, in our practice, we are all like children learning to write the alphabet. The letters come out bent and sloppy, time and again-the only thing to do is to keep at it. And if we do not live life like this, what else is there for us to do? A good practice is to ask yourself very sincerely, “Why was I born?” Ask yourself this question three times a day, in the morning, in the afternoon, and at night. The Buddha told his disciple Ananda to see impermanence, to see death with every breath. We must know death; we must die in order to live. What does this mean? To dies is to come to the end of all our doubts, all our questions, and just be here with the present reality. You can never die tomorrow, you must die now. Can you do it? Ah, how still, the peace of no more questions. Real effort is a matter of the mind, not the body. Different methods of concentration are like ways of earning a living-the most important thing is that you feed yourself, not how you manage to get the food. Actually, when the mind is freed from desires, concentration arises naturally, no matter what activity you are engaged in. Drugs can bring about meaningful experiences, but the one who takes a drug has not made causes for such effects. He has just temporarily altered nature, like injecting a monkey with hormones that send him shooting up a tree to pick coconuts. Such experiences may be true but not good or good but not true, whereas Dharma is always both good and true. Sometimes we want to force the mind to be quiet, and this effort just makes it all the more disturbed. Then we stop pushing and some concentration arises. But in the state of calm and quiet, we begin to wonder, “What’s going on? What’s happening now?” and we are agitated again. The day before the first monastic council, one of the Buddha’s disciples went to tell Ananda, “Tomorrow is the Sangha Council. Others who attend are fully enlightened.” Since Ananda was at this time still incompletely enlightened, he determined to practice strenuously all through the night, seeking full awakening. But in the end, he just made himself tired. He was not making any progress for all his efforts, so he decided to let go and rest a bit. As soon as his head hit the pillow, he became enlightened. In the end, we must learn to let go every last desire, even the desire for enlightenment. Only then can we be free. Everyone at all ages have experienced loss in many degrees. It can be as trivial as a missing toy to the loss of a property or life. Some losses can be replaced but others not. hence, the irreplaceable ones are usually harder to come to terms with. When the bigger losses occur in someone’s life, there will be a tendency to go in search of ways to help reduce the emptiness. It has to be said that the practice of yoga has helped many to cope with loss by healing their mind, body and soul. Not only that, but before the process of healing, yoga can also assist in the process of acknowledging and accepting one’s loss which then exposes one to the feeling of grief. Acknowledging one’s loss is very important in recognizing the fact that the ‘something or someone’ was in their life but is not around anymore. Depending on the loss, one may be able to go on with life as before, with the same routine and expectations. But at times, changes have to be done in consideration of such absences, to be able to lead a normal life again. Acknowledging and accepting one’s loss are two different things. With acceptance, the natural and unavoidable response is grief. While many prefer to evade grieving experiences, due to culture, upbringing or fear, it will be advisable to let your guards down and let sorrow move through you. It is just like any problems in life, when not dealth with, will remain unsolved and cannot be expected to dissapear. This will have a detrimental effect on one’s emotional life in future. We sometimes refer to this as emotional baggage. Yoga teaches that everything in this world is not permanent and never be ‘yours’ as it all comes and goes. So do not focus on what you have lost because there are still more things to come. Therefore learn to let go on past experiences and open your mind and soul to whatever awaits you in the future. Such is the reality of life. A simple pranayama technique, known as the alternate nostril breathing helps to regulate the breath in a slow-paced manner, resulting in a sense of calmness. When this breathing exercise is done in combination with awareness, it helps clear the mind. The breath and mind go together in helping to create a positive attitude in life. Lastly, it will also be beneficial to read Sally Kempton’s ‘Navigating Change’. Besides acknowledging and accepting loss, it is similarly important to acknowledge and accept change. In order to free yourself, keep in mind that change is unavoidable, therefore learn to let go.